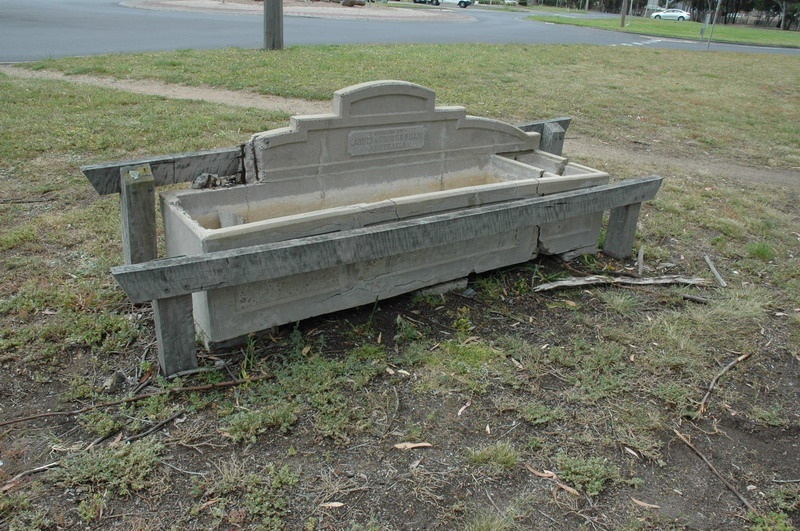 The Bills drinking trough, corner Walker and Rennie Streets, Lara, is significant as it forms part of the Annis and George Bills Estate, which was established to provide watering facilities for horses after George's death in 1927. The concrete structure is also a legacy of the days of horse drawn vehicles, before the motor car was introduced. The Bills drinking trough is historically and socially significant at a LOCAL level. The Bills concrete trough is associated with Annis and George Bills from c.1927, who established a fund in the early 20th century to provide adequate watering facilities for horses and dogs (Criterion A & H) . This trough is just one structure of over a thousand troughs throughout Australia, and the U.S.A. which are a legacy of the Bills Estate. It is one of only two known to survive in the Greater Geelong municipality. The trough is recognised by the local Lara community as demonstrating a distinctive custom that is no longer in use (Criterion G). The Bills cement trough, near the RSL Hall in Rennie Street roadside, Lara, consists of two parts with one large horse and one small dog trough. There are incised rectangular panels on the front side of the structure, with an elaborate curved back. The trough rests on rectangular concrete members. Surrounding the structure are introduced, protective timber posts and rails. At the time of the site visit, the trough showed signs of considerable deterioration, with spalling concrete and cracks evident. Subsequent to the site visit, the trough was removed from the site in October 2012 and is under repair.